Email marketing is much more than writing and sending great emails. For such an old technology, it’s actually a highly technical channel and paying attention to details matters more than you’d believe. One of these technical details you’ve gotta nail is email deliverability. If you’re like a lot of people I know (and I know a few online marketers), you might not even know what email deliverability means, exactly. Or you may have heard of it, but haven’t given much thought about how it affects your email marketing campaigns. As explained by Jimmy Kim, CEO & cofounder of Sendlane and instructor of our latest course, Advanced Email Marketing, email deliverability is one of the most important aspects of your email marketing—and one that’s frequently overlooked. Why? Because if you don’t get it right, your emails will never even reach your subscriber’s inbox. And there’s a lot more to it than you probably expect. Let’s take a deep dive into the dark, nerdy world of email deliverability, and learn how you can make sure your subscribers get your emails every time you hit the “Send” button. As you may have guessed, email deliverability is the likelihood of your emails arriving in your subscribers’ inboxes. You may be wondering why you even have to worry about email deliverability. Assuming your subscribers’ email addresses work, don’t all your subscribers get your emails? If not, why wouldn’t they? The reality is that your emails may end up in your recipient’s junk folder without either of you realizing it. Statistically speaking, this is more likely than you think: according to ReturnPath’s 2018 Email Deliverability Benchmark Report, 15% of emails never make it to the inbox. What’s more, according to Cisco Talos Intelligence Group, 85.27% of all emails sent are considered spam. While such large volumes of spam emails occur due to professional spamming operations, your emails can easily, inadvertently get mixed up in that ocean of spam if you’re not careful. Your ESP accepts your content in its mail server (also known as MTA). They send it to the recipient’s mail server (like the one from Google, if it’s Gmail) through multiple cloud servers. Before it gets to your recipient’s mail server, it gets processed through spam filters. If all goes well, the email gets delivered to your recipient’s MTA. The recipient gets the email in their inbox. The key here is that there are actually a bunch of stops along the way, and email deliverability problems can start anywhere in this process. 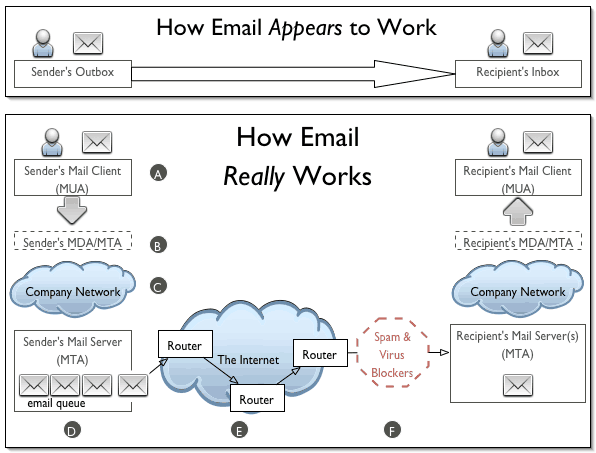 For example, if your ESP or your ISP (your Internet Service Provider) considers your email sending behavior as “spammy,” your emails may be rejected as soon as they hit your own MTA, or when they hit the spam blockers, or when they reach your recipient’s MTA. Before we get into the specifics of improving your email account’s infrastructure and reputation, you need to see if there are any issues with them to begin with. Learn how to skyrocket your email opens, clicks and sales! Take an in-depth journey into automation, deliverability, engagement and more in our Foundr course, Advanced Email Marketing. Click below to learn more and join our VIP waitlist to be notified when the course opens for enrollment. Learn How to Skyrocket Your Email Opens, Clicks and Sales! Click To Join Our FREE VIP Waitlist Now. MxToolBox. This tool analyzes your email headers, the reputation of your outbound IP address, and your SPF records (Sender Policy Framework, an email authentication method). From all this, they generate a comprehensive deliverability report flagging any problems you may have. Sender Score. This tool, from Return Path, works like a credit score for your email’s reputation. You get a score from 0 to 100, the higher the number, the better your reputation and the higher your email deliverability rate. Mail Tester. This is a simple tool that analyzes your messages, your mail server, and your sending IP. From this analysis, it gives you a detailed report of what’s configured properly and what’s not. I highly recommend you test all these tools at the same time, since they analyze different aspects of your email account. With the data provided by these tools, you will have a good idea of your email deliverability, and in the case that you have any problems, what they are. With that said, it’s now time to work on improving your email deliverability. Infrastructure is the foundation on which you base your email marketing. This is the most technical part, but the one that can help you increase your deliverability and lower the chances of getting your emails flagged as spam. This piece is especially important for companies that send hundreds of thousands of emails per month. If you don’t send that many emails, some of the solutions shown below may not be the most relevant. Still, it’s important to be aware of these issues as your company grows and your email volume increases. Your IP is like the ID card when it comes to internet connection—everyone has to have one. All popular ESPs (Mailchimp, Aweber, etc.) have their users share the same IP. The problem is that if one of these people is a spammer, all the people who share the IP will get flagged as well. Just as you wouldn’t want to share your ID with a thief, you don’t want to share your IP with a spammer. Fortunately, all ESPs monitor the reputations of their shared IPs, making sure no spammer gets away with the crime, so you will rarely be penalized by this issue. Once your email volumes are in the thousands of emails per month, however, consider getting a dedicated IP. All advanced email marketing tools—like Sendgrid and Mailgun—offer this service, along with all the major email automation companies that have enterprise-level accounts. It’s important to highlight the fact that you need to send a lot of emails for this to be appropriate. If you have a dedicated IP and you don’t send a lot of emails on a consistent basis, then it will be hard to be considered a trustworthy, spam-free sender, and that negatively impacts your deliverability. A feedback loop (also known as FBL) is a service that ISPs offer to companies that want a report of the number of complaints received (for example, when a subscriber hits the spam or junk button in their inbox). If people are telling their ISPs that your emails are junk instead of unsubscribing to them, you can easily get flagged and see your deliverability rates go down. Feedback loops help senders get a sense of the way their subscribers perceive their emails and resolve any situation that arises, by unsubscribing those people who flag their emails as spam, for example. To apply for feedback loops, you can check the guidelines at this site, which help you see how each ISP manages them. One obvious way to improve your deliverability is to make sure no one can access your account. The more secure your email, the lower the chances of having a hacker steal your information or use your account for their benefit. Use strong passwords. Create highly secure password combinations to make sure no spammer can guess them. Only allow logging into administrator-level accounts from a few secured computers that are not accessed by other users. Restrict the access of your account to a few people. Make sure to restrict administrator capabilities to those who aren’t in charge of your entire account. You can even enforce a two-person rule, where the administrator password and the two-factor authentication device are kept by two separate people. Save your passwords in safe places, like 1Password, LastPass, or even better, an analog notepad—no spammer will be able to access them. In email marketing, reputation refers to a set of specific metrics directly related to your email sending practices. As a rule of thumb, the higher your reputation, the higher your delivery rates. Senders with low reputations, on the other hand, get blocked at the gateway or their messages land in the “junk” folder instead of the inbox. As indicated above, when people tag your emails as junk or spam, it counts as a complaint. The more complaints there are, the worse the reputation and the lower the email delivery rates. If your ISP sees there’s a large number of complaints, they can start to block you without you even realizing it. Your ultimate goal is to keep your complaint rate very low, less than 0.1% of email sent. Here’s some more information on how to reduce spam complaints. When marketers say “content is king,” that also applies to email marketing. The better your content, the more recipients will enjoy it, and the lower the chances they will flag it as spam. While the content matters, your email must also be formatted in a way that will make your subscribers want to receive it and even respond to it. Simple design is often all it takes for most readers; after all, you want them to check your email’s content, not its design. “What design?” you may be asking yourself. It’s true. Our design is so minimal it’s not even funny, but that’s what makes it effective. The fact we keep our email focused on the content is one reason email has become such an important part of our marketing strategy. When in doubt, choose a minimalist email design that has a lot of white space and little to no fancy elements in it. High-volume senders are always suspicious and risk a potential red flag from both the ISP and the recipients. After all, how many emails would you want to receive from any company? Large companies, like ecommerce retail giants Best Buy and Target, often send daily emails, sometimes even twice a day. This doesn’t present a problem for them because they are consistent. The problem starts when a company that often sends 100,000 total emails triples the email volume in a month and then goes back to the average amount. ISPs take consistency into consideration, so make sure to always keep a steady volume and avoid spiking your sending volumes for no reason. Sometimes people will provide you with incorrect email accounts, and in some other cases, their email address might cease to exist (because, for example, they stopped working at an organization). In this circumstance, the sender will receive a “bounce” for every subscriber with an incorrect address. While it’s only natural, high bounce rates may indicate a sender bought the email addresses, or that it’s trying to “guess” them. In the case that a subscriber of yours changed their email address, you must take them out of your list. That will keep the list health high and keep the bounce rates at low levels (below 1%). There’s one obvious lesson here: Never buy, rent, or “guess” an email list. When I say guess, I am referring to searching the internet and using tools like Hunter.io to find an email and then adding that email to your subscriber list without the person’s permission. Building your list in this way will increase your bounce rates (and volumes, as explained above), which will lower your delivery rates because the subscribers don’t know who you are. ISPs throughout the world have lists of spammers whose emails are rejected or sent straight to people’s junk folders. These are called blacklists. If you get flagged enough times as a spammer—that is, if your reputation gets bad enough—you can end up on these lists, which can get you blocked by many ISPs. That means your emails will get rejected before they even hit your recipient’s inbox. Some of these blacklists include MailBlacklist, SpamCop, SpamHaus. While the chances of this happening to any honest marketer like yourself are very low (it’s not like spammers would be reading this post, and if they are, shoo! Get! ), you need to be aware of the existence of these lists and keep yourself off of them by all means. If you’re in doubt as to whether your company is in on one of them, you can use this tool. Authentication is an “ID check” for your mail streams. Email authentication is basically a way to prove to your ISP that your email hasn’t been hacked. It validates that the email is actually from you, and not some spammer impersonating you. The process of authenticating your emails doesn’t guarantee that your emails will be delivered, but at a bare minimum, it helps you to differentiate your business from spammers. You establish a policy that defines the specific authentication rules from your domain. You configure your mail servers to implement and publish these rules. The mail server that receives the email for your recipient authenticates your email by comparing the details from the email received against the rules defined by you in the previous step. Based on the results of this authentication, it decides whether to deliver, flag, or reject the email. There are three main email authentication methods, each one touching on different aspects of the entire process. Sender Policy Framework (SPF): It allows senders to define the IP addresses allowed to send emails from a particular domain. DomainKeys Identified Mail (DKIM): It provides an encryption key and digital signature that verifies that an email message was not faked or altered. Domain Message Authentication Reporting & Conformance (DMARC): It unifies the SPF and DKIM authentication mechanisms into a common framework. It also allows you to declare how you’d like your emails to be handled if they fail an authorization test. To implement any of these methods (or all three of them), you need to work with your email servers, which will depend on the company you’re working with. I know this can be rather technical if you aren’t aware of how this works. You can find more information here in this handy guide. This guide will also be helpful if you use Google Apps. Email deliverability is a technical (let’s face it, annoying) thing that marketers must contend with. It’s your responsibility to make sure your company not only behaves, but is considered an ethical company based on your email marketing tactics. For starters, make sure you have a sturdy infrastructure that sustains your email sending volumes. Then, you need to take good care of your reputation by using responsible, user-friendly, and spam-free email practices. Finally, you need to keep your account safe by authenticating your account and the emails that come from it. Now we want to hear from you. Have you run into any email deliverability problems? If so, what did you do to correct them? Let’s hear your thoughts in the comments below.